India remains a mystery to many Americans, even as it is poised to become the world's third largest economy within a generation, outstripping Japan. It will surpass China in population by 2032 and will have more English speakers than the United States by 2050. InIn Spite of the Gods, Edward Luce, a journalist who covered India for many years, makes brilliant sense of India and its rise to global power. Already a number-one bestseller in India, his book issure to be acknowledged for years as the definitive introduction to modern India. In Spite of the Godsilluminates a land of many contradictions. The booming tech sector we read so much about in the West, Luce points out, employs no more than one million of India's 1.1 billion people. Only 35 million people, in fact, have formal enough jobs to pay taxes, while three-quarters of the country lives in extreme deprivation in India's 600,000 villages. Yet amid all these extremes exists the world's largest experiment in representative democracyand a largely successful one, despite bureaucracies riddled with horrifying corruption. 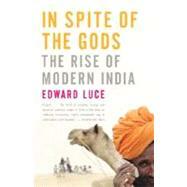 Luce shows that India is an economic rival to the U.S. in an entirely different sense than China is. There is nothing in India like the manufacturing capacity of China, despite the huge potential labor force. An inept system of public education leaves most Indians illiterate and unskilled. Yet at the other extreme, the middle class produces ten times as many engineering students a year as the United States. Notwithstanding its future as a major competitor in a globalized economy, American. leaders have beenencouraging India's rise, even welcoming it into the nuclear energy club, hoping to balance China's influence in Asia. Above all,In Spite of the Godsis an enlightening study of the forces shaping India as it tries to balance the stubborn traditions of the past with an unevenly modernizing present. Deeply informed by scholarship and history, leavened by humor and rich in anecdote, it shows that India has huge opportunities as well as tremendous challenges that make the future "hers to lose." EDWARD LUCE is the Washington bureau chief for the Financial Times. He was the paper’s South Asia bureau chief, based in New Delhi, between 2001 and 2006. From 1999–2000, Luce worked in the Clinton administration as the speechwriter to Treasury Secretary Larry Summers. Educated at Oxford and married into an Indian family, Luce now lives in Washington, D.C.
Its stupendous population consists of farm laborers. India is one vast farm—one almost interminable stretch of fields with mud fences between. Think of the above facts: and consider what an incredible aggregate of poverty they place before you. It took a long time. But finally in the late 1990s India started to build roads that could get you from A to B at something better than a canter. Until then, India’s most significant highway was the Grand Trunk Road that bisects the country from north to south. Laid at various stages by the late medieval Mughal dynasty, then upgraded and extended by the British in the nineteenth century and popularized by Rudyard Kipling in his novel Kim, most of the “GT Road,” as it is known, got acquainted with asphalt only after independence. But it is a single lane and one can rarely exceed an average of thirty miles an hour. So the relative novelty of India’s double–lane expressways still generates a buzz. By 2006, India had all but completed the 3,000-mile “Golden Quadrilateral” expressway linking the country’s four largest cities: Delhi to Mumbai (formerly known as Bombay) to Chennai (formerly known as Madras) to Kolkata (formerly known as Calcutta) (*) to Delhi. Average speeds on the better stretches are closer to sixty miles an hour. For some, the expressways have heralded a modern era of speed, punctuality, and hygienic roadside bathrooms. For others, they represent a brash intrusion on the more lackadaisical world they cut through. To me, the new expressways provide an intriguing juxtaposition of India’s multispeed economics. Curiosity—and an instinct of self-preservation—means I occasionally move into the slow lane. One of the best ways of observing India’s galloping new economy is to count the number of car brands that whir past you in the fast lane. You tend to lose count at thirty or forty. In the early 1990s, as India was starting to relax import and investment restrictions on foreign manufacturers, you would at best have counted six or seven makes of car. More than 90 percent of them would have been Ambassadors, the stately but desperately uncomfortable colonial–era vehicles that are still used by VIPs, and Marutis, the cramped family passenger car, still manufactured under a joint venture between Suzuki of Japan and the Indian government. Nowadays you have little time to register the tinted and reflector windows of the Toyotas, Fiats, Hondas, Tatas, Fords, Volkswagens, and Mercedes–Benz, as they flash past. But your speed is never quite what it should be. Coming far too frequently from the opposite direction, but on your side of the road, you encounter decrepit scooters, bicycles, and even camel–drawn carts, whose drivers appear blissfully unfazed by the fact that they are breaking all known rules of traffic and common sense. Once or twice, on the two–hundred–mile Delhi expressway to Jaipur, a city in the neighboring state of Rajasthan, my journey has been brought to a halt by a herd of goats. Even without the local fauna, the absence of lane discipline means you are mostly on the edge of your seat. But it is at the side of the expressways in the glaring billboards advertising cell phones, iPods, and holiday villas and the shiny gas stations with their air–conditioned mini–supermarkets that India’s schizophrenic economy reveals itself. Behind them, around them, and beyond them is the unending vista of rural India, of yoked bullocks plowing the fields in the same manner they have for three thousand years and the primitive brick kilns that dot the endless patchwork of fields of rice, wheat, pulse, and oilseed. There are growing pockets of rural India that are mechanizing and becoming more prosperous. But they are still islands. It is in this almost continuous contrast that you observe the two most striking features of India’s early–twenty–first–century economy: its modern and booming service sector in a sea of indifferent farmland. It would be tempting, as you cruise happily toward your destination with a reasonable chance of being on time, to believe these features are from different worlds. Along the way, you might also glimpse an occasional factory and an assembly plant or two for vehicles or washing machines. But evidence of manufacturing in India is far thinner on the ground than it is in neighboring China. By the time of independence, Nehru had already helped to forge a consensus in which the country would aim for complete economic self–sufficiency and the state would lead the effort by building up heavy industry, with an emphasis on steel plants and large dams. It has become fashionable since 1991 to write off Nehru as a hopeless idealist who tied the country up in socialist red tape for forty years. Much of the criticism is fair,(*) since India failed to achieve the high economic growth rates that were seen at the time in Japan and later in South Korea, Taiwan, Thailand, and Malaysia. But in the late 1940s and 1950s Nehru’s economic strategy was perfectly in step with worldwide economic fashion. It came with the blessings of a team from the Massachusetts Institute of Technology in Cambridge, which advised New Delhi on the country's early five–year development plans. India was also advised by Gosplan, the Soviet Union’s economic planning agency. Nehru’s plans for a closed economy dominated by the state also came with the blessings of Britain’s postwar Labour government, which had agreed to Indian independence, and which carried out its own nationalization of private sector industries to a far greater degree than did Nehru’s India. Many of the Labour government’s Fabian advisers were accorded a warm welcome in Nehru’s New Delhi. Indeed, it was not until fifteen to twenty years after India’s independence that international praise of the country’s economic model was outweighed by rising concerns about its effectiveness. Until then India’s trajectory was uncontroversial and relatively unexceptional. Yet, in retrospect and in comparison to other developing economies in Asia, Nehru’s economic policies served India poorly. In 1950 South Korea, which was yet to emerge from its war with Communist North Korea, had the same living standards as India (roughly $50 annually per capita in 2005 prices). Fifty years later, South Korea’s per capita income was above $10,000, which was more than ten times higher than that of India. More or less similar contrasts can be found between India and most of the countries of east and Southeast Asia. Even China, which devoted much of the first thirty years of its revolution to countrywide terror, now has double India’s per capita income, having started at about the same level at the time of its revolution in 1949. Why did Nehru’s approach fail? In the answers can also be found the explanations for why India’s economy today is developing in such a curiously lopsided way. At independence, India was an overwhelmingly rural, agricultural, and impoverished country. Almost nine out of ten Indians lived in villages and depended on the meager yields of farming, mostly subsistence farming, to live from day to day. In 1951, when India conducted its first census after independence, the country had a literacy rate of only 16 percent—which means little more than one in seven of its 320 million people could even sign his or her name. Average life expectancy was just thirty–two years, an extraordinary but credible figure that gives a fair picture of the abysmal quality of life for most of India’s villagers. Common descriptions at the time talked of emaciated peasants with visible rib cages, “coolies” half bent from a (short) lifetime of manual labor, and children with potbellies from protein deficiency. India at independence was a country desperately in need of rural land reform and measures that would drastically boost crop yields so it could feed its people and build a launch pad for future growth. What it got instead was public steel plants and aluminum smelters, which not only were, for the most part, heavily loss–making but also ate up India's precious foreign exchange resources. The Indian farmer needed local irrigation projects to help insulate him against the vagaries of India’s wildly erratic annual monsoon. Instead Nehru unveiled grand dams, most of which are now crumbling and some of which were never completed. The average Indian also needed to learn how to read and write and have access to antibiotics and antimalaria drugs, without which it was virtually impossible to escape poverty. Instead, Nehru’s Congress Party governments poured resources into universities for the urban middle classes and into new public hospitals in the cities. Hindsight makes it easy to dismiss as hopelessly optimistic Nehru’s belief that devoting most of India’s scarce financial resources to grand projects would propel the country to industrial status within a generation. Yet even at the time there were skeptical voices who questioned whether higher education should receive the same budgetary allocation as elementary education, in a country where 84 percent of people were illiterate. (2) There were also a few critics who wondered whether the amount New Delhi spent on agriculture should be as low as a third of the total spending in India’s first five–year plan, which was launched in 1952, plummeting to less than a fifth of spending in the second plan in 1957, when more than four–fifths of people depended on farming to survive. (3) But their voices were drowned in a sea of utopian rectitude. The disparity between the Indian policy elite’s dreams for tomorrow and what most Indians needed at the time was stark. To be fair, Nehru had tried land reform and to some extent succeeded in getting rid of the most feudal end of the spectrum. The notorious zamindari system that had been set up by the British in most of northern India, under which large landholders, the zamindars, were responsible for collecting taxes for the British from a penurious peasantry, had virtually been abolished by the end of the 1950s. But in most parts of India, Nehru’s land reforms were either watered down or sabotaged altogether by the local Congress Party elites, who, to Nehru’s growing frustration, were drawn disproportionately from the ranks of upper–caste landowners and notables. Nehru also tried and failed to set up cooperatives among the smaller farmers, whose plots were too small for mechanization and fertilizers to be affordable. Nehru’s cooperative reforms, which were influenced by China’s policies of the same era, were also shot down by Congress Party bigwigs at the local level—where they mattered. An impeccable democrat, Nehru at times expressed envy of China’s ability to push through whatever it wished, whether the people wanted it or not. But he never gave any hint of a tendency to authoritarianism. “Let there be no doubt,” Nehru told India’s parliament in 1959, “I shall go from field to field and peasant to peasant begging them to agree to it [cooperative farming], knowing that if they do not agree, I cannot put it into operation.” (4) But even if he had succeeded, it is doubtful cooperative farming would have made much of a difference in a country where caste divisions are most bitterly experienced at the grassroots. The failure of Nehru’s overall model became apparent at two different moments, a generation apart from each other. The first was in 1967, when Indira Gandhi, who had taken over as prime minister in 1966, two years after her father’s death, was forced to devalue the Indian rupee under pressure from the United States and the International Monetary Fund (IMF). India’s relative neglect of agriculture had been compounded by the incomplete success of Nehru’s land reforms—large numbers of Indians remained landless. In exchange for increased international aid to enable India to import food following a succession of poor harvests, Indira Gandhi was compelled to swallow some unwelcome economic medicine. In devaluing the currency, the aim was to prevent future payment crises by stimulating greater exports and thus earning more foreign exchange. (*) But it marked a symbolic defeat for swadeshi, or self–reliance, the centerpiece of Nehru’s master plan for India. The second and even more dramatic moment came in 1991, when India’s economy went into a tailspin after its foreign exchange reserves dropped almost to zero in the aftermath of the Gulf War, which had triggered a steep rise in oil prices that technically bankrupted India. (*) Iraq’s decision to put a torch to the oil fields in Kuwait before it retreated from advancing U.S.–led forces was the straw that broke the camel’s back for India’s economy, which was already living beyond its means. Unlike in 1967, when the lives of tens of millions of Indians depended on foreign aid, by 1991 India was more than self–sufficient in food production, having roughly doubled its agricultural yields in the “green revolution” of the 1970s and 1980s. Scientists from India and abroad had developed much better yielding varieties of rice and particularly of wheat, the two principal staples of the Indian diet; these advances had boosted output dramatically. But the very real successes of the green revolution were no comfort in 1991, when the final death knell sounded for India's swadeshi hopes. In exchange for emergency balance of payments assistance from the IMF, India again devalued its currency and was required to move much of its gold as collateral to London. Nehru’s socialist dream of creating an economy that would be immune from the influence of the former colonial powers had culminated in bankruptcy, and worse, a bankruptcy in which it was London that played the symbolic role of pawnbroker in saving India from collapse.